The Dictionary of Energy, Second Edition is a comprehensive and authoritative reference on all aspects of energy and its role in society. Edited by Cutler J. Cleveland and Christopher Morris, the editors of Handbook of Energy, Volumes 1 and 2, this authoritative resource comes at a time when the topic of energy prices, resources and environmental impacts are at the forefront of news stories and political discussions. 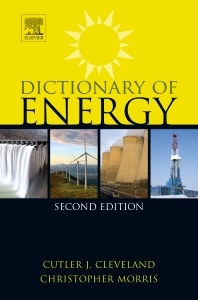 The Second Edition of Dictionary of Energy contains over 10,000 terms, across 40 key subject areas in energy (e.g. solar, oil & gas, economics, models, policy, basic concepts, sustainable development, systems, renewable/alternative energy, water, etc), with additional window essays on key issues, such as Biomass, Ecological Footprint, Exergy, Fuel Cell, and Hybrid Vehicles. Dictionary of Energy, Second Edition is a valuable reference for undergraduate and graduate students, academics, and research scientists who study energy, as well as business corporations, professional firms, government agencies, foundations, and other groups whose activities relate to energy.